MOSCOW, April 26. /TASS/. The US missile attack on Syria’s Shayrat airbase on April 7 posed a life-threatening danger to Russian military servicemen, so now the Defense Ministry is taking necessary measures to ensure their security, Russian Defense Minister Army General Sergei Shoigu said on Wednesday at the opening ceremony of the Sixth Moscow Conference on International Security. "We consider the missile attack to be a blatant violation of international law. Besides, Washington’s move posed a life-threatening danger to our military servicemen who have been combating terrorism in Syria. In light of such actions we have to take additional measures to ensure the security of our forces," the Russian defense minister added. Lavrov said Washington’s missile strike on Syria’s Shayrat airbase postpones the creation of a broad anti-terrorism front. The ceasefire brokered due to efforts of Russia, Iran and Turkey and launching the talks in Kazakhstan’s capital Astana contribute to establishing an intra-Syrian inclusive dialogue, Russia’s top diplomat said. "The recent US missile strike on the Shayrat airbase, which was a blatant violation of the international law and an act of aggression against a sovereign state, exacerbates the current problems and postpones the prospects of setting up a broad anti-terrorism front," Lavrov said. Lavrov compared the current situation with the 2003 events in Iraq, which led to the country’s destruction and the emergence of the Islamic State terrorist organization (outlawed in Russia). This dangerous development of events may spark a repeat of "similar incautious steps." "Provocations like the April 4 incident in Khan Shaykhun demand professional investigation under the auspices of the Organisation for the Prohibition of Chemical Weapons (OPCW) and on a geographically balanced basis. This investigation must be open and transparent," Lavrov said. The attempts to block this approach cast doubt that those who try to use the April 4 incident for altering the agenda, ditching the UN Security Council’s Resolution 2254 and calling for changing the Syrian regime act in good faith, he said. The Russian Defense Ministry is ready to support the United States’ efforts aimed at resolving the Syrian crisis at an early date, Shoigu said. 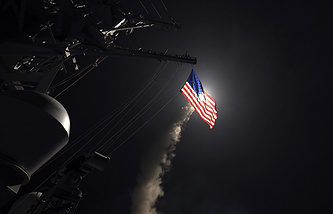 The minister recalled that cooperation with the US was restricted by the framework of the Memorandum to prevent mid-air incidents over Syria, which was suspended by Moscow after the US strike on the Syrian airbase. Shoigu described the US strike on Shayrat airbase as a threat to the Russian military. "However, if the United States is indeed committed to eliminating the Islamic State (IS, terror group, outlawed in Russia - TASS), we are ready to support its efforts," Shoigu said, adding that it was only possible to destroy the IS in Syria through joint actions by all interested countries.